Who can use this Appointment of Sales Consultant template? 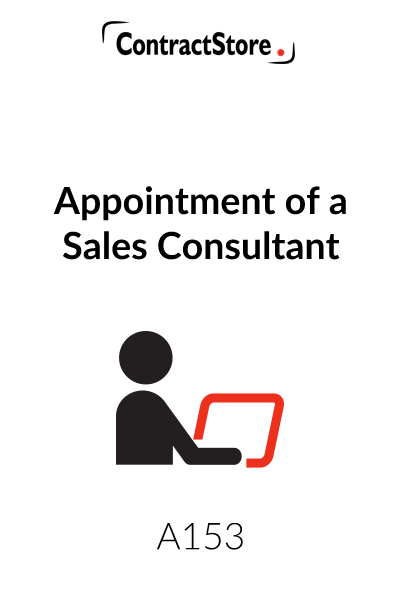 This appointment of a sales consultant is for use by a company that is looking to appoint an individual to promote its products. What is this Appointment of Sales Consultant for? The appointment is in the form of a letter addressed to the sales consultant. The company will issue it on the company’s letterhead and the consultant will accept it by countersigning a copy of the letter. What are the main issues for the appointment of a sales consultant? Role of the consultant. 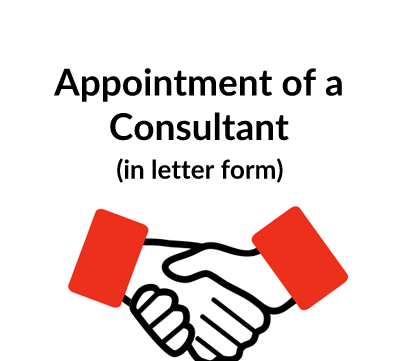 The appointment will set out the services and obligations of the consultant. They will include promotional activities as well as following up on the company’s leads and reporting on a regular basis. Set out your requirements clearly so as to avoid future argument about what the consultant’s duties are. Fee arrangements. These will vary, and the company will usually pay the regular basic fee to the consultant plus agreed expenses and commission on sales. Restrictions on authority. A sales consultant has a more limited role than a sales agent and will not normally have any authority to make commitments on behalf of the company. Confidentiality. Clearly, the company needs to be sure that the consultant will keep all commercially sensitive information confidential and a clause is needed for this. What detailed terms does the Sales Consultant Appointment template contain? A schedule is attached, detailing products to be covered by the agreement, services to be provided by the consultant, territory and fees, commission and expenses. For all more information on each of these sections, see our Explanatory Notes below which you will also receive when you download the document from our website. 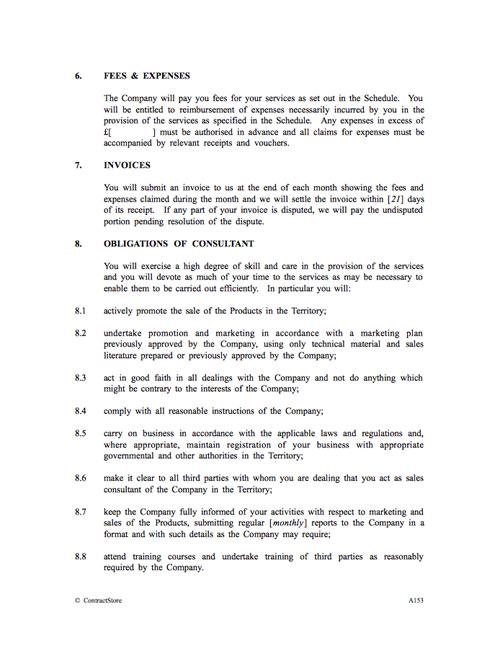 This Agreement is for the appointment of an individual to act as a sales consultant. It is prepared in the form of a letter to be issued on the headed notepaper of the company making the appointment. Two copies of the letter should be signed on behalf of the company and one of these should be countersigned by the consultant and returned to the company, thus constituting the legally binding contract between them. This briefly describes the work of the consultant, and defines the territory in which they are to operate. The Consultant’s Services and Territory are to be detailed in the Schedule. This clause details the commencement date and duration for the consultant’s services. The consultant, while not an employee, is required under clause 3 to provide services for an agreed number of hours/days per week/month and holidays need to be taken after the dates have been cleared with the company. Clause 4 deals with the possibility of either the company or the consultant being responsible for maintenance of office and other facilities. One of the alternatives in this clause will have to be deleted or amended depending on the circumstances. This Clause details the Consultant’s obligation to report progress to the Company, and provisions for changes to the services provided by the Consultant. The Consultant’s fees and expenses are to be detailed in the Schedule. 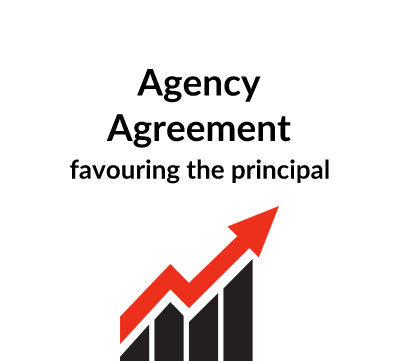 Under the terms of the Agreement, the consultant operates on a self-employed basis and submits invoices for his fees and expenses to the company. This clause sets out some fairly generally worded obligations on the part of the consultant. So far as the consultant’s obligations are concerned, specific services which are not covered by clause 8 should be dealt with in the schedule. Clause 9 makes it clear that he has no authority to commit the Company or to accept any orders for products – unless expressly authorised in writing on a case by case basis. 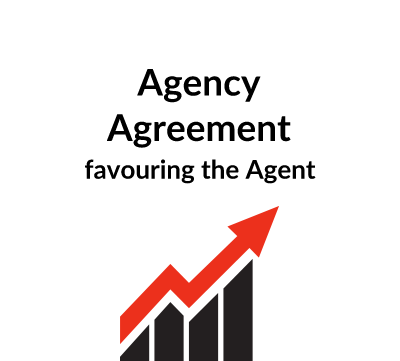 Legal advice is recommended as to whether this agreement might be interpreted as creating the appointment of an agent and, in consequence, whether the law governing agency, in particular the agent’s rights on termination, might apply. This clause sets out some fairly generally worded obligations on the part of the company. Under the terms of the Agreement, the consultant operates on a self-employed basis and is responsible for payment of his own taxes. Clause 12 deals with confidentiality and the protection of the intellectual property rights of the company and of any manufacturer of the products which are covered by the Agreement. Like Clause 12, Clause 13 deals with confidentiality and the protection of the intellectual property rights of the company and of any manufacturer of the products which are covered by the Agreement. This clause prohibits assignment and subcontracting. If either party becomes insolvent or commits a material breach of the agreement then it is sensible to give the other party the right to terminate. This clause makes specific reference to the Consultant’s sales targets. It is usual for someone who ends their relationship with a company to be restricted from taking business or soliciting customers of his former firm. Legal advice should be obtained as a restriction which is too widely drafted may well be unenforceable. Limiting the period of the restriction and confining it to a relevant geographical area can help to ensure its enforceability. This Clause indemnifies the Company against any liability that the Consultant incurs as a result of some wrongful act of the Consultant. This clause explains the governing language of the contract. Hopefully no disputes will arise, but it is sensible to specify the law of the country which governs the agreement – usually that of the country which both parties are resident – and also to say how disputes will be resolved if they do arise. As above, it is sensible to specify the law of the country which governs the agreement – usually that of the country which both parties are resident.